You probably didn’t hear about this, but James Murdoch was asked to address University College in London on the anniversary of the first copyright law 300 years ago. James is the son of Rupert Murdoch, who is chairman & CEO of News Corporation. Like father like son, James has an even more twisted & distorted view of copyright as his dad, Rupert, who is implementing a paywall around many of his news publications (see “Rupert Murdoch’s Pathetic Paywall“) . Anywho’s… enjoy the read! It’s a long post, but well worth the time. It’s not only educational AND entertaining, it’s also a hoot! BRAVO, MR. MASNICK! TV Commercials – Why isn’t anyone complaining??? Is it just me? Hasn’t both the length & number of commercials gotten utterly ridiculous over the past few years? I timed two programs over the past month, one on cable at a friend’s house & one on commercial broadcast TV. Both averaged nearly 5 minutes of commercials for every 6.5 minutes of content. If the time & number of commercials isn’t bad enough, add in that they also repeat the SAME crappy commercial numerous times during a 2 hr period. I don’t know about the rest of you, but too much airing of the same commercial pretty much turns me off on ANYTHING that commercial sponsor offers. Maybe I’m just oversensitive. My only source of TV (of which I watch very little) is via over-the-air commercial broadcasts. When they made the transition from analog to digital last year, as expected I lost more than half of our previous stations (I live in a rural area). For those stations we lost, I now download from the Internet what we used to watch on those stations. Uh… gee… uh… OUTSTANDING QUALITY & NO COMMERCIALS!!! Maybe watching all this high quality, commercial-free content from the Internet over the past year has made me overly sensitive? Nyah… that’s not it. Don’t get me wrong — I understand the business model for commercials & free over-the-air broadcast TV. It’s just that, IMHO, the length & number of commercials has gone way beyond what is reasonable or tolerable. I, frankly, can no longer tolerate it. It just amazes me that all the millions of cable subscribers out there continue to tolerate their steadily increasing rates, coupled with increasing quantity of commercials. When I last had cable (over 14 years ago), all the channels had significantly fewer commercials than broadcast TV (except for the local broadcast channels, TBS & WGN). Now nearly all the channels on cable appear as dicked up with commercials as regular over-the-air broadcast TV. SUCH A DEAL!!! As mentioned previously, I’ve never watched much TV and after 12 yrs of “getting screwed by cable” in Northern Virginia, I vowed I’d never again get cable. I’m also not interested in satellite TV. But seeing how many (& how long) commercials are aired, not just on broadcast TV but now even on cable & satellite, well… I’ve pretty much had my fill of it. I understand that with a DVR I could fast forward through all the commercials. What I don’t get is how frakking stupid the networks are! With everybody fast forwarding through the commercials with their DVRs over the past several years, what do the networks do? Show even more & longer commercials? AND… they now steal screen real estate & put them on while the program is still airing? WHAT A BUNCH OF FRAKKING IDIOTS!!! In my opinion, they’re doing everything within their power to turn people off on broadcast/cable/satellite TV. And I tell ya… it’s definitely working for me. About the only channel we watch in our household anymore is PBS. Granted – their fund raising drives can get a little irritating, but hey… that’s kinda how they survive, and it’s only a few times a year. My recommendation? Support your local PBS! UPS – Uninterruptible Power Supply — A MUST HAVE! If you don’t yet have one of these, I’d highly recommend one (or more). I’ve been using them for over 12 years, and just bought my 4th & 5th units. In the past I’ve mainly used them to guard against power surges, spikes, sags, brownouts and other power abnormalities. But they also make great backup power supplies for DSL/Cable modems, routers, cordless phones, laptops and/or netbooks, cell phones, etc. The first three I purchased have been used on my desktop systems, not necessarily for their “uninterrupted” power, but primarily because of their superior surge protection. When connected to a UPS, I’ve never lost any electronic eqmt due to power surges, lightning, etc. I purchased my two most recent UPS’s for devices other than my PCs (although they’ll make great backups for my 7 yr old UPS’s). One is for my DSL modem/wireless router, network switches and VTech cordless phones. The other is for recharging my laptop when the power is out. If I had a new wide-screen HDTV & home theater setup, I’d put all of that equipment on a UPS, too. Power outages at our house over the past 14 years have gone from monthly to just a few times a year. Even so, it’s a royal pain in the arse when all your phones are cordless… can’t even call the power company to tell them the power is out (we don’t have cell phone coverage at our home, and I can’t imagine where I last saw one of our old “Ma Bell” hardwired phones). Even more disruptive is being cut-off from the Internet! With my DSL modem & wireless router attached to a UPS, I can still surf the Internet with my laptop/netbook for hours, or as long as the laptop/netbook batteries last. (That’s why I purchased an extra UPS just for powering/recharging my laptop & netbook.) 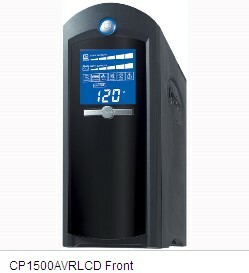 A UPS is also great for charging your iPhone, iTouch, cell phone, mp3 player, etc., etc., etc. What UPS to buy? It looks like the “main” brands are APC, Tripp Lite, CyberPower & Eaton. APC is the most expensive, but that’s what brand all five of my units are. The only reason I bought APC is that’s what Sam’s Club sells (at a reasonable discount). The last two APC units I bought were Model # BN1250G (1250VA/750Watt) for $145 each. If I had it to do over again, I think I’d go with either the Eaton Powerware 5110 1500VA/900Watt or CyberPower CP1500AVRLCD (1500VA/900Watt). 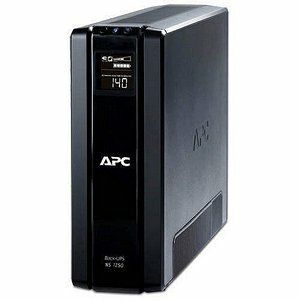 Both are available on-line for about the same price (or less) than I paid for the APC 1250VA units. Amazon.com has one of the bigger selection of UPS’s at reasonable prices, but be sure to check out pricegrabber.com for the lowest price. Just make sure you shop around, as prices vary as much as 100% for the same units. What size should you get? I’d recommend getting the largest capacity you can afford (i.e., 1500 VA / 900 Watts). More capacity means more time on the battery per given load. As a minimum, I’d get double your estimated load. For example, if your PC & monitor consume 300 Watts, I’d get at least a 600 Watt unit. As long as you purchase double the estimated load, you should get 10-15 minutes of battery time should the power go out. 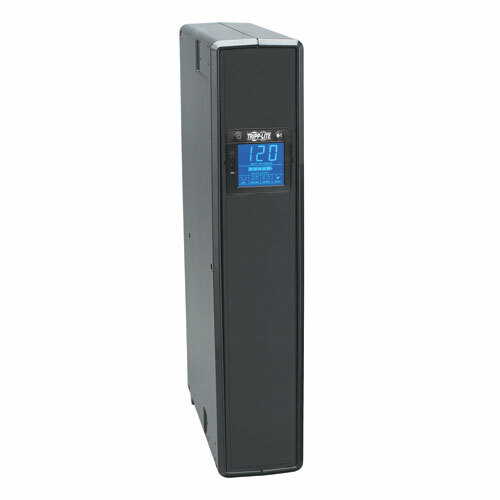 Again… the higher the capacity of the UPS, the more time of usage you’ll get on the battery with your current load. When your only load is a DSL/Cable modem and wireless router, you should get hours of use with a higher capacity unit. With respect to connectivity, each of the above brands connect to your PC & have software that save & close any open files and safely shutdown your PC during a power outage. Although the batteries used in a UPS are usually warranted for only 2 or 3 years, I’ve only had to replace one set and that was after 7 years of continuous use with numerous power outages. If you don’t have a portable/standby power generator in your home inventory, an Uninterruptible Power Supply (UPS) is convenient to have on hand. Its uses are only limited by your imagination & the power capacity of the unit. But don’t forget — the PRIMARY purpose of a UPS is to protect your electronic equipment! I strongly recommend that you use one with all electronic equipment that you value. Whatever… I actually prefer having my own web site and blog, where I have some control over what I release (or don’t release) about myself and that nobody reads except me. Not so with Facebook. In my opinion, whatever you put on Facebook… it’s going to get out (if not already out there for all, or at least advertisers, to see). Of course… whether or not you have a “presence” on the web, there’s still likely info about you on-line. What kinda’ irritates me about “Facebook Invites” is that you have to create an account just to see what whomever invited you to see. No thanks. I’m kind of an “anti-sheep” kind of guy. Whenever a large # of people think something is really great, then I begin to wonder why & tend to move in an opposite direction. I detest fads, and avoid them like the plague. For reasons NOT to delete your Facebook acct, see this. And for the ultimate reality check & why the blame ultimately rests with “us,” see this.